It is only in the afternoon shortly before checking out that I decided to finally open the bedroom curtains… Here they were in front of me.. Probably 3 miles away or maybe less. One of the most magnificent wonders of the world. The main reason for millions around the world to travel to Egypt. 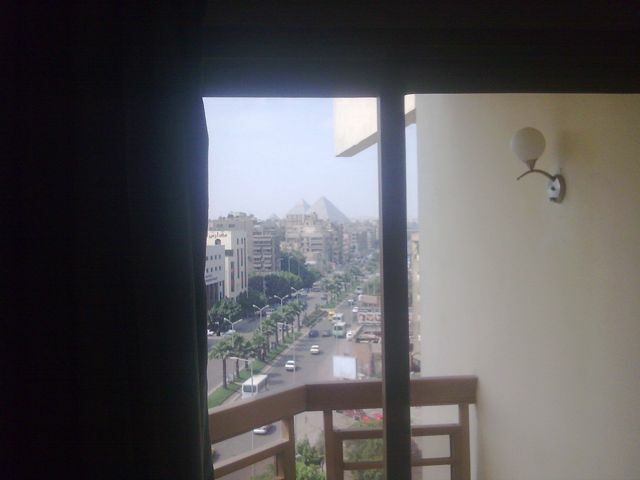 The Pyramids of Gyza… Behind this meter wide window, I was experiencing one of the best hotel room view in the world. Time stopped. They were there sitting quietly on top of charming Cairo. Magnificent. Ageless. Powerful and discreet at the same time. I guess some people have often the same feeling walking around Le Louvre and suddenly, unexpected, standing in front of Mona Lisa after walking randomly through the wide corridors. It made me think, “how many hotels in the world can claim to have a nicer view?”. Was I looking at one of the nicest possible room view? Unfortunately I only had my mobile phone camera to capture that moment. Poor image quality but that is a picture I will always keep. And a “moment” I will always remember. Unexpected moments are often the best. I was charged USD 65 for that night. But how much was that actually worth? Taking only the hotel hardware and software into consideration for sure it was over charged. But that 2 minutes I spent looking through this dirty window was priceless. For those who are curious to know more about this hotel, here is the hotel website URL. Knowing the efforts we often deploy to find USPs for some random hotels or trying to turn meaningless hotel brands into “a unique guest experience”, any branding Guru would love to have a go at that one! Even for free! The entire hotel brand should be built around this unique view from the rooms. At every touch points. Can a hotel build its branding strategy exclusively around its location? Does it compensate management’s mediocrity and incompetence? Can a view or a location makes the hotel experience totally irrelevant? Is it actually true that the three most important things in a hotel are the location, the location and the location? I personally thought that this “Location x 3” was very exaggerated, but, will I go back to that dull hotel during my next visit to Cairo? Actually… I think I will. If anyone went through a similar experience where the view from the bedroom has totally outperformed the actual hotel product, I would love to hear about it.